I usually set the length of the "shutter button pressed" pulse from the Stackshot(etc) to be long enough to see the red LED on the controller. I use 0.5 seconds I think. Camera opens shutter, to start say a 2 second exposure. At 1 second, Stackshot "releases the shutter button" - flash fires. At 2 seconds, Camera closes shutter. 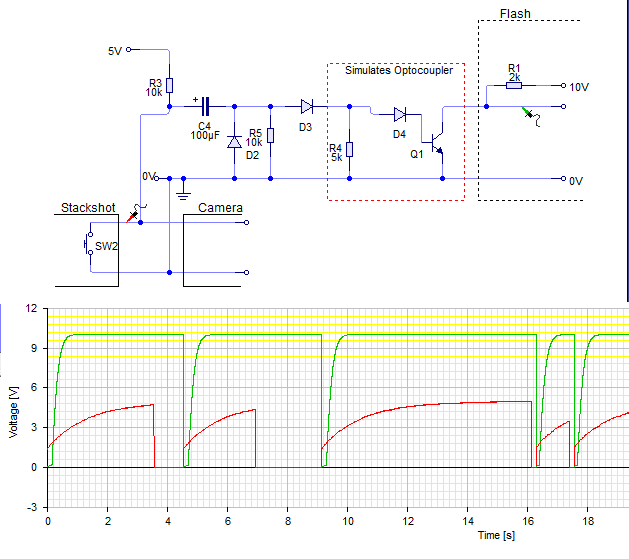 (there's no Opto coupler in the simulator I'm using, so I made a rough simulator. The input led actually needs "from 40µA", at about 1.2V forward voltage. D4 plus VBE is ~1.4V, at which the 5k takes ~280µA. I used 10V in the flashgun just to make it different. Ground wouldn't connect through the actual Opto. Green goes down (to fire flash) when Red is released from 0V. NB there's no power added anywhere, 0.5mA comes from the camera USB shown as 5V, otherwise flash or Stackshot.